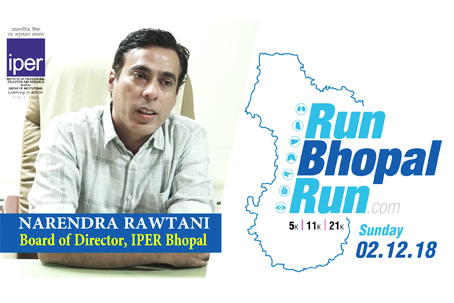 Run Bhopal Run is supported & promoted by IPER, as it stands for a great cause. Focusing on Healthy Lifestyle is crucial before we miss the bus. Bhopal should lead the way as the city of fitness enthusiasts. Many experts consider running as one of the easiest form of cardio exercise. Plus, running burns calories and can build strength, among other things. There’s also a long list of psychological benefits runners can get from this sport. You must get yourself into running if you haven’t done it in a while – or ever – can be brutal. But once your body and mind start to acclimate, running can be blissful and provide a sense of freedom. Bhopal Runners, a young organization has its members from all age groups and walks of life. The organization started its first running club at Char Imli locality and has since conducted regular runs on weekdays and long run on weekends. Bhopal Runners conduct training sessions, cross training clinics and workshop on injury free running, nutrition, physical and mental fitness and helps its members in choosing the right gear. Bhopal Runners to strengthen the nexus between de addiction of tobacco and other habit forming substances, gender, environmental issues & other social issues organised an event called Run Bhopal Run in association with Government agencies and civil societies. On 6th December 2015, the flagship event of Runners is Run Bhopal Run (RBR) took place.